Last week, I posted an article examining a report from The Economist listing jobs that it believes are most at risk from computerisation (see below). According to The Economist, accountants, economists, pilots, retailers, amongst others, are all in the firing line. Algorithms for big data are now entering domains reliant upon pattern recognition and can readily substitute for labour in a wide range of non-routine cognitive tasks. Many service occupations – from fast food counter attendants to medical transcriptionists – which have been a key driver of jobs growth over past decades, could all soon be replaced by automation. Now The Atlantic has released a report of its own, arguing that nearly half of current jobs in the United States could be replaced by robots within a decade or two. Manufacturing, administrative support, retail, and transportation will continue to lose workers to automation – as has been the case for decades. However, cashiers, counter clerks, and telemarketers are equally endangered. The Atlantic also provides the below chart showing the ten jobs with a 99% likelihood of being replaced by robots and software, which are typically routine-based tasks (telemarketing, sewing) or jobs that can be solved by smart algorithms (tax preparation, data entry, and insurance underwriters). At the bottom, the chart also lists the dozen jobs considered least likely to be automated, with health care workers, safety officials, and management positions dominating this list. It would be anxious enough if we knew exactly which jobs are next in line for automation. The truth is scarier. We don’t really have a clue. If you are young person seeking a career, you would be well advised to begin looking at these new trends and studying The Economist’s and The Atlantic’s reports, and then hope that there are no technological breakthroughs that make your chosen vocation redundant. The most obvious jobs is missing from the list : politicians!! All hail our new robot overlords!! Thank you for submitting your CV for the position of 24 hour slave. We have had many excellent candidates apply for this position but unfortunately on this occasion you were not successful. We wish you the best of luck in your future career. Bank based Economists must have a higher probability of robot replacement surely? A simple program could be written: Economic bad news = media soundbites on lower interest rates, Confusing data = lower interest rate demands, good economic news = threat to high dollar and lower interest rates? Surely a robot could manage this? Data heads downward = soft landing etc…. Similarly spruikers, lobbyists and astroturfers (some of whom comment on this website), must be under threat of robot replacement? The robot just needs reprogrammed everytime a political party implodes? Call me crazy, but I think spruiking and lobbying is an art. It is about speaking to people’s ideology with the right premise at the right time under the right situation. We may not like them, but they will not be replaced easily. You could well be right but couldn’t a robot be programmed to recognise a fellow robot’s ideology and thinking, and to know when to strike and to play a part in the game theory to come to a “deal”? We need more spruikers spruiking the art of spruiking (if you know what I mean!). Pehaps 3d1k ver 2.3 is further off than I thought…. Well put it this way, I’d say there is certainly the role for machines in social-media based spruiking. But throwing one liners out there is only part of spruiking, another part is coming up with and successfully delivering arguments to actually convince people to do what you want them to do. That’s the hard part! Perhaps your robot could convince my robot….. I don’t think that all jobs will be either “automated” or “not automated”. In the field of patent law where I practice, we have seen huge efficiencies driven by search engines like patent lens, etc. This cuts down the number of people needed in the office to perform the same work. That said, the core function of being able to draw up a patent or patent licence seems to permanently be outside of machine capability. The above graphs seem to o binary for my taste. The real factors I would like to see is what percentage of particular jobs will be automated, rather than the probability of the whole job being automated. Hopefully we get rid of patents altogether by then as what’s the point of holding a 20 year patent on a technology that is obsoleted 10 weeks later. @mig – that would be a really bad idea. Try getting a loan to manufacture goods in an open market. Banks would laugh at you unless you had some collateral showing you had exclusivity in that product line. Patents remain useful for small scale manufacturers of high tech products (otherwise, what is left of non-food manufacturing will get off-shored altogether). Frankly that’s complete BS, small scale manufactures are much better off remaining nimble and moving the ball quickly to maintain market share / dominance, resorting to Patents should be an absolute last resort. Individual Patents are for the most part useless and expensive, btw the more specific they are the more useless they are. Patent is great if you’re a patent troll, as you cannot be counter sued. Except I think recently someone – overstock.com I think – showed prior art then sued the toll for fraud – something like that. They won. Your comments seem to highlight just how out of touch the Techno Division of the FIRE sector is. Patents are big money business. Just ask Kia – he is an example of how that side works. There may be examples of little guys doing well with patents, but I don’t know of any. That’s part of the bloody problem — first, thanks to you guys, it costs a packet to even file an application – which puts you at risk of having it stolen – so you need to be a Big Guy to begin with. Then, if you do get the patent, the banks will say you don’t have the expertise to bring to market and will stranglehold you until you sell for pennies on the profit! DISCLOSURE: There are patents out there with my name on them but do you think I ever got anything but a “wage” for it? Stranglehold is the word from our experiences of the last 2 years! We went down the road of securing loans & equity against our patents to get into production – either way there were a lot of sleazy suits pulling stunts to cut us up in any fashion they could to get to the goodies! I don’t know what I’d do if I had a worthwhile lightbulb moment – certainly wouldn’t go to a bank for them to try & fleece me! In our experiences they’re a terminal cancer! Put me firmly in the camp expecting some MAJOR breakthroughs in robotics over the next 10 to 20 years. One of the major changes is distributed intelligence, Cell phone like devices (eg Raspberry PI) are creating local intelligence that can be embedded into devices like a robotic hand. This will have far reaching consequences because it simplifies the top-level task, it removes all the how-to-do something from the top-level systems implementation problem. Furthermore it makes this function a commodity which means volume for the producer of the widget AND low price for the user of the widget. 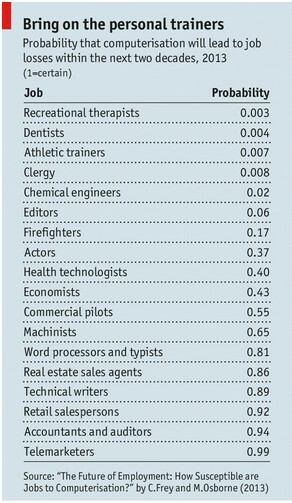 Personally I’d say jobs like Firefighter are very high on the list of jobs that will be largely replaced by robotics. Think about it WHY do you want to put extra people at risk. We can already see this trend in war situations where various forms of aerial and land based drones (robotics) are increasingly common as are smart munitions. If I were in the construction Industry I’d also be very worried. Beat Police are also increasingly being replaced video surveillance and software to recognize “events” and alert response teams, this all equals reduced head counts for the beat police. As for the Healthcare Professionals survival bent of the Atlantic article, I’d suggest this is a bit of 2000’s extrapolation gone wild. The US health care system is in worse shape than the Aussie RE system, It must be fixed and fixing it means less people not more, so I’d expect to see automation become a major focus point for reducing systemic healthcare costs. There’s a lot of low-hanging-fruit in the geriatric care area, where a personal robot that could keep grandma company play a game of cards with her, make sure she is breathing, take her out for a walk. This is a HUGE potential market, but its cost sensitive. This brings us full circle, the commodity widget functionality of modern robotics will enable new price points for field functionality which will enable new applications. Today we’re at the proverbial hockey stick inflection point ask me again in 5 years time and we’ll be able to see where this capability has created viable markets. Total cost ~$150!! Running SELinux RDPing into their standard terminal servers. Migtronix, Big Data is a marketing term that covers loads of stuff. This is part of the problem. There’s actually nothing new under the sun when it comes to BD. But if I was trying to define “what is different NOW”, I’d say that there are two main trends. One is the huge increase in data being captured, stored and made available, the Internet leading the way there. The second is the availability of massively more storage and computational power to do stuff to that data. Companies like Amazon, Google, eBay and Yahoo have both built their businesses around this, and pioneered the technology themselves. This is creating lots of new applications, micro-marketing being the most obvious. Now companies are looking at hitherto neglected piles of data, and saying “can I do something with that”? At the same time, Artificial intelligence and other technology fields are using the vast computational power now available to process data much more cleverly. Auto-trading would be a good example here, but there are lots. Many in medicine, defence etc etc. But the basic fact is this – data can only tell you what is in it. You can cross it with other data to increase its value. You can use stats, math and analysis to create insight. But you can’t make something out of nothing. If I have the entire history of every horse race ever and the smartest prediction algorithms known to man, I still can’t beat the insight of a trainer who has inside knowledge of the horse running in the next race (now if you had all the data of the horse’s training runs and nutrition etc maybe you could beat it, but even then its marginal). This is not to knock the value of this space, its just that marketing is way ahead of reality in many cases. @davel Yep yep believe I don’t do the marketing 🙂 Its become quite painful to work on Hadoop systems in the last year — all these marketing types run up to you and want to know what you think of Cloudera (awesome btw)! Ugh! Yeh, its the usual hype cycle – Big Data is right on the ‘peak of inflated expectations’ right now. RPi passed the 2 million mark last august I believe, so they are probably close to 3m now. It has been a remarkable runaway success! I work in the Big Data field, more or less, and when I see articles like this I perceive a lot of hype… But there definitely IS change coming, its just extremely tough to see which will be the ‘killer apps’ for Robotics in the same way it was tough to predict for the Internet. Same goes for Big Data – generally, data is dumb. Patterns can be deduced from data yes, but in most cases these deliver less insight than a small amount of human expertise, or at least the latter is needed to derive value AFTER the machine-analysis has happened. But there are areas where this is and will change, just not clear what they are yet. And as you say, its more likely to bring a degree of automation not replace jobs outright. Some advances may even create whole new jobs. A good example of this would be the people who collect and process sports data now, this just didn’t exist 10 years ago (though these people may be ripe for automation-replacement themselves). The other thing to consider is that it is well-understood now that humans make many decisions subconsciously, intuitively, and these decisions are almost always better than decisions based on rational, logical analysis alone. The reason being that they’re accessing vast stores of experiential data and intrinsic knowledge in our brains that the conscious mind doesn’t have access to. Machines can only substitute this when its understood exactly what all of the possible inputs are into any given decision-making process, and how the subconscious decision-making process actually works. In many cases this is unknown. In the Big Data game isn’t the intent essentially to resolve very large sparse matrices to rationalise large inputs into a much smaller decision tree — so you can make decisions quickly based on value/weight of the node? Basically isn’t the human intervention very far down that line after the “robot” has done most of the work? Oops see reply above, posted in wrong spot. A lot of software engineering tasks can now be automated through rapid prototyping software. Engineers with skills in specific technical or scientific disciplines can now focus on the application of those skills without the need for the implementation skills. Build an application with block diagrams and a bit of high level code, hit a button and deploy it to hardware. Yeah good luck with that for anything more complicated than CRUD operations. Out of curiosity, have you ever tried or played with some of these? I’ve written flight control algorithms for unmanned aircraft using both conventional languages and automatic code generation (for real research vehicles which have flown successfully). The labour savings not just in the code generation but in streamlining the whole test and evaluation process are huge. Of course, lots of businesses still baulk at slightly increased capital costs (software licenses and maybe slightly more expensive hardware as autocode is usually slightly less efficient as custom code) but will happily spend 10x that in labour costs to do the same job. Binary->assembler->compiled languages->interpreted languages->graphical languages and the tools to translate from down the chain. The higher up you go, the less specialisation you need in software and the more you can focus on the science behind the algorithms. @Nogen Yeah graphical languages work well enough for the tasks they are designed for. However, while the time saving / labour cost saving potential might be large, the labour replacement potential is not. Also pretty soon you start running into limitations in that more often than not most of these systems are essentially code generators anyway. The higher up you go, the less specialisation you need in software and the more you can focus on the science behind the algorithms. Ofcourse. You still need someone to write these high level codes …. When I watch a company employing six people to do a job that could be done by one person and a software license in the same amount of time, I would say the labour replacement potential is large. I don’t understand your comment “more often than not most of these systems are essentially code generators anyway”. All these languages are converted down the chain to binary at some point. As the human machine interface becomes more “natural” the skills required to do this translation manually decrease. Of course you need people to write higher level languages, but you need far fewer than an entire industry writing code in lower level languages as is common in many industries. Nogen: Yes for an engineer its waaaaaay easier and more productive – but you have to be an engineer to begin with! Most people can’t deal with the idea that the input might not be the correct one let alone all the considerations a real system needs to account for. In many cases this has been true for a atleast a decade now. It is a matter of bad business practices and not really technology coming to the forefront. That is many of the languages spit out code in whatever their internal system is programmed it and run it. You put a block on screen, internally a block of precanned code is put into a text file or memory. Don’t want the precanned code. Well now you need a programmer to create your own. Most visual programs are essential an extension of the reusable code paradigm. Done properly, you should be able to achieve similar efficiencies anyway. Not my point. Yes you get efficiency with high level languages but you still need a programmer or engineer or someone to do something useful. Yeah you need one less person who can type code. But the guys that actually design the system are are still there. I think that was my original point… but the difference is that someone like me, who is a specialist engineer can now design a block diagram that demonstrates a system, run simulation demonstrating the system, run software in the loop testing of the same model, run hardware in the loop testing of the same model, and finally deploy the model on a real system in the field, without any significant knowledge of hardware, real-time programming, operating systems etc etc cuts a lot of people out of the process. I hope you aren’t implying that safety critical flight control software isn’t put through it’s paces in testing! Simulink …. why am I not surprised …. it’s designed for a niche purpose and there are many such similar niche systems. and finally deploy the model on a real system in the field, without any significant knowledge of hardware, real-time programming, operating systems etc etc cuts a lot of people out of the process. Can get pretty much all that for free but it a convenient place to look. Simulink is but one example… While the Realtime Workshop started with Simulink, it has since evolved into Simulink Coder and Matlab Coder for use with general Matlab code. While I have no problem with python, you are paying for something specific when you fork money over to Mathworks. That is reliably tested engineering software that is fully integrated with complex systems engineering processes and quite often link to certification activities. That is why it is used extensively in every university and in every big aerospace or automotive company that I know people in… serious people doing serious stuff. It’s a photoshop vs GIMP debate. This has been promised for at least 20 years (see original functional languages like Z). BPM would be a more recent attempt. Generally they have failed to deliver because in practice there are too many changes that need to be made that then outweigh the benefit of the automation. Again, this is changing but progress is exponentially slower than people tend to expect. It took decades for automation to chip away at car manufacturing and software is not much different just because it is ‘bits and bytes’. @Nogen I have no issues against Simulink or Matlab. They are both useful tools. However my statement still stand. A lot of software engineering tasks can now be automated through rapid prototyping software. This is simply not true. More efficient yes, automated no. If you believe this then you don’t have a good grasp of the SE process and/or what RAD/RPS is . Seems we are arguing semantics then as happens in autonomous systems research generally. Autonomy is a spectrum. Automation means moving something up the spectrum. Autonomous or automated means the system boundary has been drawn around something with no human interaction. Every step of automation removes required skillsets. Google recently acquired DeepMind, an AI outfit. Maybe they’ll one day automate blog article writing? No wait, this has already happened for routine publications like Thomsons.